The Epson AcuLaser CX29DNF printer is a multi-functional printer (print, scan, copy & fax) that's designed for small businesses. The CX29DNF is a must for work environments where multiple users want to print large volume jobs to a high professional standard. A downside to the CX29DNF is that it hasn't got Wi-Fi connectivity. The Epson AcuLaser CX29DNF isn't ideal for businesses that are limited when it comes to space, at 430 (w) x 544.2 (d) x 584.4 (h), mm the printer is fairly bulky. On the plus side the Epson AcuLaser CX29DNF comes with AcuBrite cartridges which are renowned for their ease to replace, allowing users a hassle free experience when ink does run out! The Epson AcuLaser CX29DNF is able to print large volume jobs thanks to its exceptional high standard memory of 256MB. Another strength of the CX29DNF it that it offers users options to increase the performance of the printer in line with their demands. For example, if the standard 250 sheet paper tray capacity isn't enough for your business you can add an additional 250 sheet paper tray – perfect for growing businesses. 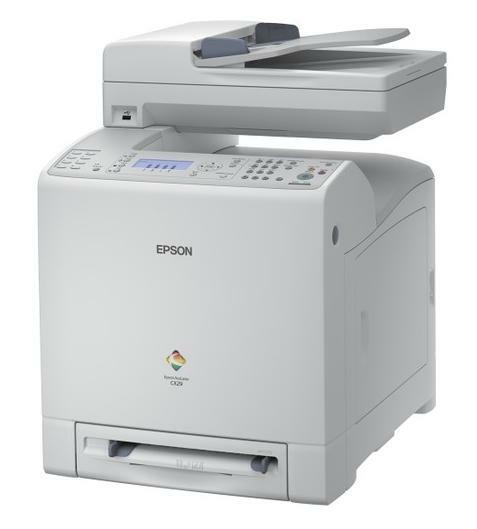 The Epson AcuLaser CX29DNF, surprisingly, doesn't include Wi-Fi connectivity which is a real shame for small businesses who want to use this printer and link up many users without using an Ethernet port. The Automatic Document Feeder capacity could also benefit from being slightly larger and may prove problematic if you scan large documents regularly.